I had some friends over for dinner the other day. I made this salad as one of the sides. It was so tasty. I love a dish I can prepare ahead of time, especially when I have company. The salad was a last minute addition to the menu. A friend who was bringing a bean salad could not attend. I needed a dish to fill the gap. I used ingredients I already had around. 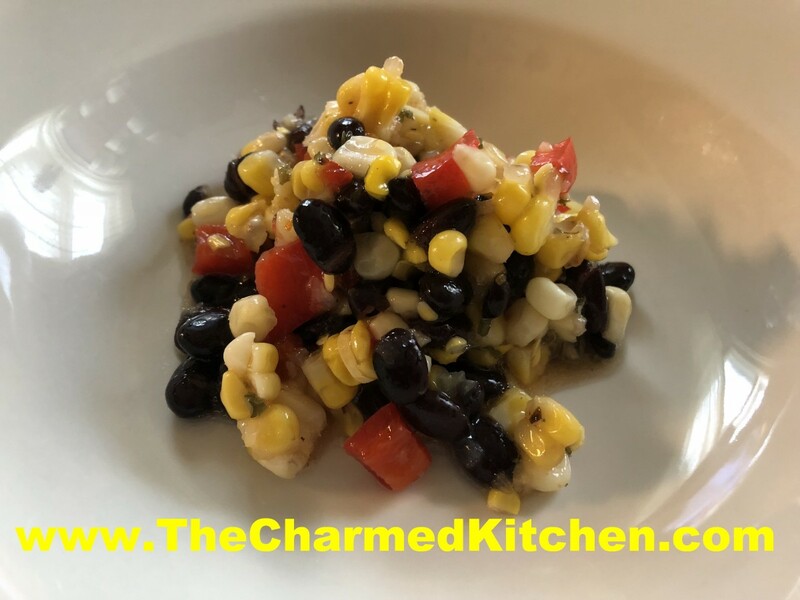 I used frozen corn in this dish. Fresh corn season is too short around here. I always buy extra corn for freezing. I just blanch the shucked corn for a few minutes in boiling water, then drop into ice water. Once the corn is cool enough to handle, I cut the corn off the ears. Then I package up the corn and freeze it. You could also grill corn and cut it off the cob to freeze. I like to boil the cobs after the corn is cut off, for a corn stock, which I also freeze. The cobs have a lot of flavor. When using the frozen corn in a salad, you’ll want to drain it after thawing. So here is the recipe. Pretty simple. You could add some sweet onion, if you like, too. Combine all ingredients in medium bowl. Stir to combine well. Chill before serving. Serves 6-8. Peanut Butter Coconut Shortbread – Vegan! I knew I was going to be spending some time with my Goddaughter and I wanted to bake something for her. I actually made her great grandmother’s shortbread recipe. She always loved them. Did I mention that Gwen is vegan? So the pound of butter normally used in them was out. I needed to change them, to make them work for her. Rather than using butter, I used a combination of crunchy peanut butter and coconut oil. They came out just right, with the crumbly, dry texture of a traditional shortbread and the added flavor of the peanut butter, coconut and vanilla. Cream together sugar, peanut butter, coconut oil and vanilla. Stir in flour until mixture forms into a dough. Press into 9×13-inch baking dish. 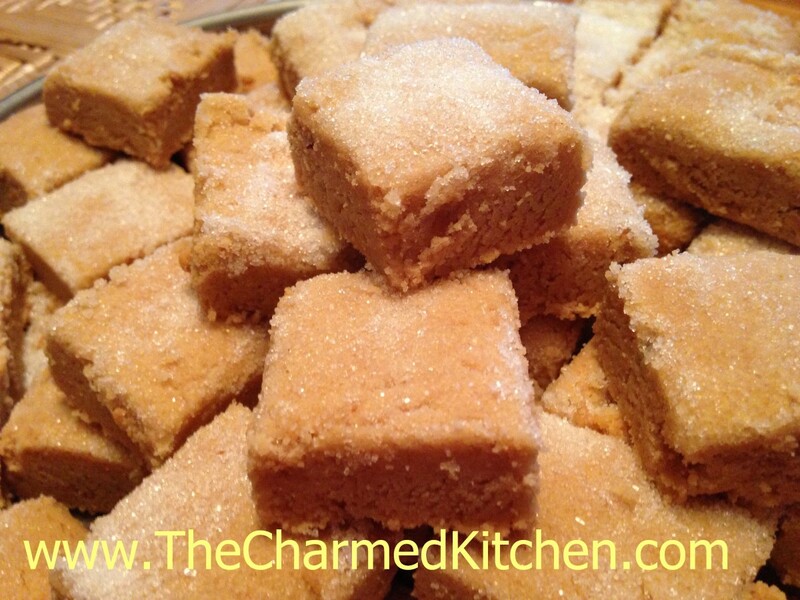 Sprinkle extra sugar over the cookies dough, and cut into squares. Bake in a 300 degree oven for an hour or until light brown around edges. Re-cut while warm. Makes 4 dozen. When you hear green or yellow split peas- do you think of soup? You probably do. But when cooked until just tender, split peas make a great salad ingredient. I often just add some cooked split peas to a tossed salad. They add flavor, protein and a nice texture to salads. An added bonus is that split peas can be cooked from dry to tender in about 20 minutes. That makes them a great choice when time is tight. 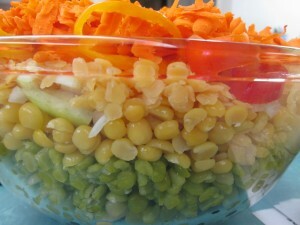 This is one of my favorite salads using both green and yellow split peas. Fresh and colorful, it is a big hit with vegetarian and non-vegetarian friends. If some of you are looking for new meatless meals ideas, this one is a winner. 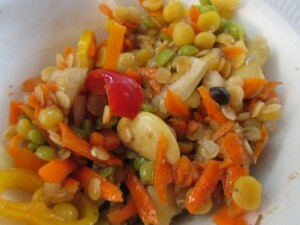 The salad uses both green and yellow split peas, along with black beans, butter beans, red lentils and assorted veggies. It is a great combination of colors and textures. It does make a lot, but you can easily cut the recipe in half. The dish was inspired by my nephew Danny’s love of sand art when he was a kid. The ingredients are layered in the bowl for a pretty presentation. It is also an homage to the layered salads I remember from my youth. I like this one a whole lot more. Cook split peas and lentils separately just until tender. Split peas, both green and yellow will take 20 minutes. Red lentils will take about 8-10 minutes. Drain and rinse each under cold water when done and set aside until ready to use, or you can cook them a day ahead and keep chilled. Each will yield about 2 1/2 c. cooked. In large glass bowl, place the following ingredients in this order. Black beans, butter beans, green split peas. yellow split peas. onion, red lentils. carrots and peppers. Pour over dressing and chill several hours or overnight. Serve on a bed of greens. Combine in a blender or food processor until smooth. *Note: Any fresh or bottled dressing you like can be used. Balsamic works very well. I often serve it with homemade Italian dressing. Friends are coming in for the holiday weekend and I wanted to bake some cookies. My friends are vegan, so butter and eggs were out. I ended up making shortbread cookies. I needed to change them though, to make them vegan. Rather than using butter, I used a combination of crunchy peanut butter and coconut oil. I had picked up some beautiful golden beets at a local farm market. I wanted to do something fun with them. I am also spending a few days with some friends, who are vegan. Since it is going to be chilly, I opted to make a soup. I added other veggies to add more flavor- and a generous amount of hot sauce. The soup has a nice kick of heat- perfect for a chilly evening. This soup can also be served chilled- so it works no matter the weather. I used my immersion blender to puree the soup. That way I didn’t have to remove the hot soup from the pot to puree it. Using a blender is fine, but be careful when pureeing a hot liquid. It will splash up in the blender. To prevent a mess and possible burns, remove the center piece of the blender lid. Place lid on the blender. Place a folded kitchen towel over the hole when blending. That way, when the liquid splashes up, the towel will prevent it from going everywhere. Also, don’t try to mix too much at a time. Several smaller loads are easier. The 2 quarts of stock should be plenty, but depending on how much your soup cooks down, you might need a little more. How thick you like your soup is a personal preference. 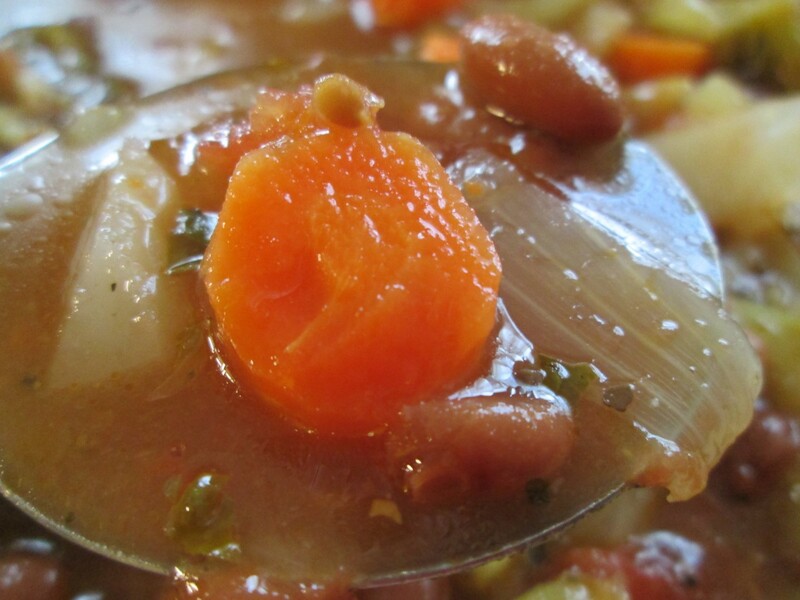 If you like a thicker soup, use less stock, or allow it to cook down more. Once the soup is pureed, you will know. 3-4 golden beets, peeled and cubed – about 2 lbs. In large pot, heat oil and cook onions until tender. Add carrots and cook a few minutes longer. Add remaining vegetables, stock, and seasonings (except the parsley) and simmer, covered for an hour or longer. Add the parsley, then puree soup in a blender in batches until smooth. 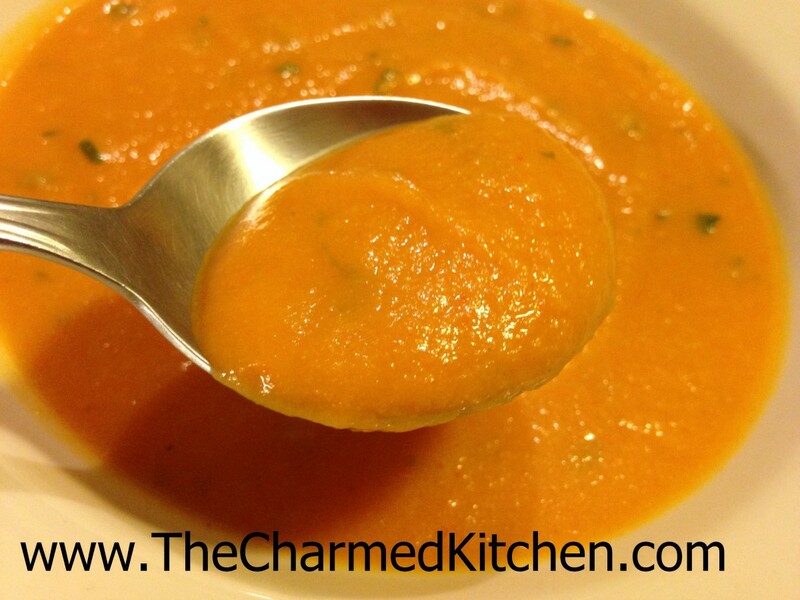 You can also use an immersion blender to puree the soup. Return to pot and add more stock, if needed. Adjust seasonings and serve. Makes a lot of soup – but freezes well. Combine all ingredients and store in an air tight container. Use this blend in tomato sauce or other Italian dishes. Sorbet is such a nice dessert for summer. Light, fruity and fresh. I try to keep a few different kinds on hand. So many fruits are abundant this time of year. They are the perfect start for a great sorbet. This peach sorbet combines ripe peaches with both basil and mint from my garden. The combination worked well together. Adding herbs and other flavorings can make sorbet even more fun to eat. You don’t need an ice cream machine to make it, either. You just puree the fruit with the other ingredients and freeze. The secret to a smooth sorbet is to puree the frozen mixture a time or two. I place the frozen sorbet in my food processor and run it until the sorbet looks creamy. Then I put it in the freezer again. For extra creamy sorbet , repeat this process a third time. 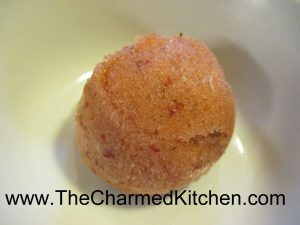 Easy to make, but there is wait time for the sorbet to freeze. Here is the recipe for the peach sorbet. I thought the herbs added a really nice touch to the final product. Feel free to experiment with the flavors you like. Now this is fun. 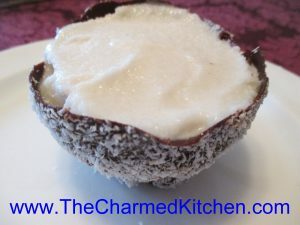 Coconut almond sorbet served in chocolate bowls. The idea is to make the dessert look like coconuts. It worked out well and tasted great. The whole dessert is dairy free and vegan as well. Great for people who have issues with dairy. You won’t miss the dairy in this recipe. The sorbet is smooth and creamy. These are fun to serve for summer parties. You can make everything ahead of time, assemble and keep in the freezer until you want them. The bowls are made by dipping inflated balloons in melted chocolate. Then you coat them is desiccated coconut to cover the chocolate. Desiccated coconut is dry and unsweetened. It looks like white bread crumbs. You can find it at Asian markets (it is the type of coconut used for coconut shrimp) . It is also found at cake decorating and candy making stores. Let the bowls set- in fridge or freezer- until the chocolate hardens. Then you just pop the balloons and remove them. You are left with a chocolate bowl. Fill the bowls with the sorbet- you could use vanilla ice cream. I suppose, but the coconut sorbet really is better in this dish. You can serve them as is- or top with some fresh fruit or chocolate sauce. So here are the directions for the bowls and the recipe for the sorbet. about 1 cup of desiccated coconut- cake and candy making stores sell it- Asian markets, too. Blow up balloons and tie the ends. Melt chocolate and stir until smooth. I melt mine in a microwave, being careful not to let the chocolate burn. Allow chocolate to cool down a bit before dipping the balloons. This is really important: if the chocolate is too hot the balloons will explode before the chocolate hardens. Also, don’t get really cheap water balloons- they pop easy. I normally melt my chocolate and then add some unmelted chocolate to the bowl, which cools it down. Place some of the desiccated coconut in a shallow bowl. Dip the bottom of the bowl in the chocolate. Use a small rubber spatula to remove excess chocolate from the bottom. It is supposed to become a bowl, so leave some on the bottom, just not a huge blob. Tip the balloon and sprinkle the coconut all over the chocolate. You can set the balloon in the coconut, too. Set balloons on a small tray, lined with wax paper to set up. This is faster in the fridge or freezer. Once the chocolate is hard- pop the balloon and be sure to remove any of the left over pieces of balloon. Keep bowls in the fridge until ready to fill with sorbet. Makes 8. When ready to fill them- scoop in some of the sorbet and smooth the top. You can do this ahead of time and store in the freezer until ready to serve. Note: If you don’t have an ice cream machine, you can freeze the sorbet in a shallow tray. Once frozen, remove from freezer and let it soften a few minutes. Break into chunks and process in a food processor to soften. Return to freezer until ready to use. Sorbet can be the perfect ending for almost any meal. I was making dinner for a couple of friends and wanted something light for dessert. I had this pineapple and knew right away I wanted to make a sorbet. You can use pretty much any fruit to make sorbet. Pineapple is one of my favorites. The ingredients are fruit and sweetener. After that, extras like fruit juices, extracts, herbs and spices are up to you. Keep it simple, or spice it up, to suit your mood. I often add fresh herbs to my sorbet. Mint is the obvious choice, but I have also added basil, lavender and pineapple sage. Keep in mind that once frozen, the mixture will taste less sweet. Sweeten to taste, but allow for that change in flavor. If it isn’t sweet enough for you once it is frozen, you can add a little honey when processing it. You can also serve it topped with a fruit syrup for extra sweetness, if desired. Note: You can repeat the process of processing another time or two. Each time the frozen sorbet is reprocessed, it will get a little smoother. 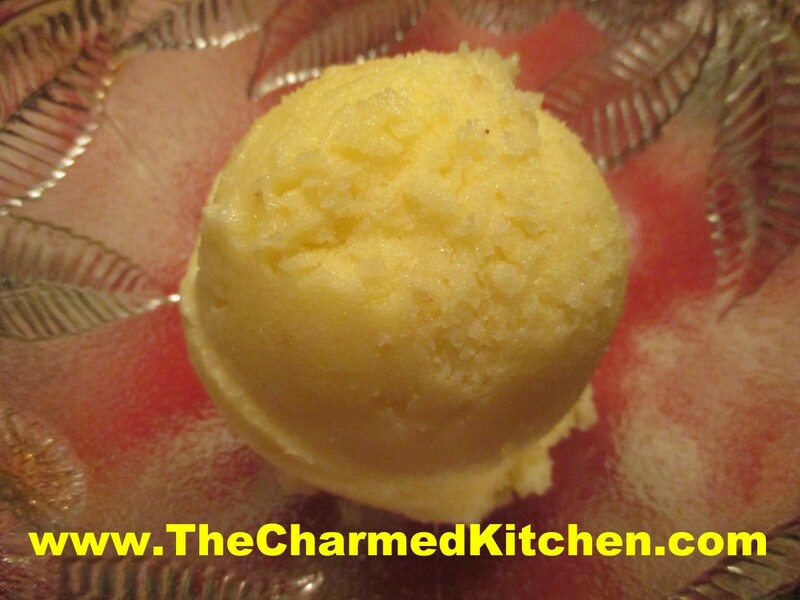 I only processed this pineapple sorbet one time- after it was frozen. The texture was delightful and my guests loved it. Yield: You should get about a quart of sorbet. If you are trying to get your family to eat more vegetables this is a great way to do it. 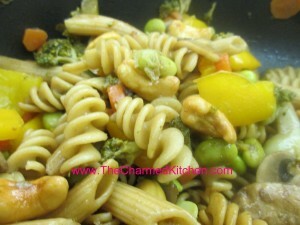 Lots of veggies with pasta, this is a simple dish that can be a side dish or a vegetarian main dish. In a small bowl, mix the 2 tablespoons sesame oil, soy sauce, vinegar, and sugar. Heat the 3 tablespoons of oil in a skillet over medium heat. Stir in the broccoli, carrots, pepper, mushrooms, shelled edamame, and cashews. Sauté 5 minutes. Mix in the sesame oil sauce. Cover skillet, and cook 5 minutes longer or until vegetables are tender but crisp. Serve over the cooked pasta or toss the pasta right in the skillet and heat through. Serves 4-6. I’ve been using stuff up and not going to the grocery store for almost 3 months now. Sometimes it takes some creative thinking to put an interesting meal together. When in doubt I can always make a good pot of soup. Soup comes easy to me. I grew up with a Mom who really knew how to make great soup. Can’t make a pot of soup without remembering her. I wanted to make a vegetable soup today so I looked around to see what I had on hand and ended up with this. Started with the basics, onion, celery, carrots. Then I added home canned tomatoes and pinto beans. Threw in some dried zucchini and dried mushrooms, too. I had a little broccoli in the freezer so I tossed that in as well. Some basil from the freezer, dried herbs and some other seasonings and it was good to go. Here is the recipe but this is the sort of soup that can be adjusted according to what you have around. dried and frozen herbs to taste- I used Tuscan seasoning and a frozen cube of basil with olive oil. Heat oil in soup pot and add the onion, cooking until golden. Add remaining ingredients, except the herbs, and cook, covered, until veggies are tender and dried veggies are re-hydrated. This will take about 30 minutes. Add herbs and let simmer 10 minutes longer. Adjust seasonings and serve. Serves 4-6.